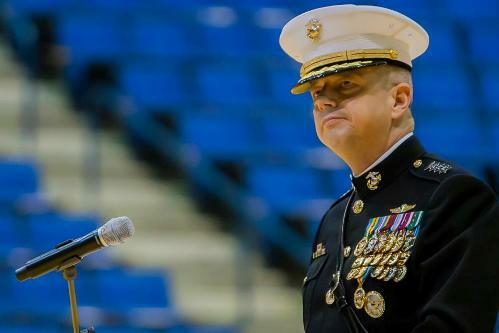 Gen. John Allen formally stepped into retirement Monday, moving on after more than 30 years in the Marine Corps with a ceremony at the Naval Academy. Allen already had been described as “retired” numerous times, but he was still on active duty through this week, as the Wall Street Journal pointed out yesterday. Likewise, Gen. James Mattis has turned over his post as the head of U.S. Central Command to Army Gen. Lloyd Austin, but Mattis won’t formally retire until June. Marine Corps Times profiled him last month. Allen’s actual retirement ceremony seems to have been conducted outside the limelight. There is no news coverage of yesterday’s ceremony that I’ve seen so far from journalists who were there, although the Marine Corps did release several photographs. After Allen’s whirlwind run as the commander of the International Security Assistance Force in Afghanistan, retiring quietly was probably a relief. He was investigated by the Pentagon for a potentially inappropriate relationship with a woman, but ultimately cleared of any wrongdoing. The White House announced in February that he’d retire. Allen discussed the future of Afghanistan in a recent interview with Jim Michaels, but the resulting story has no mention of the investigation. Allen told the Washington Post in February that he was retiring to take care of his wife, who is chronically ill. In an interview last month, Gen. John Kelly, one of Allen’s peers and friends, told me that the Corps will miss leaders like Allen and Mattis after they retire. It’s too bad that when a President is caught cheating,he isn’t accused, cleared and then asked to retire. Thank you for your tremendous and long service to our country. With all due respect,with honor You have given more than the entire world, for the whole fight wisely, we’ll miss You, with all due respect for a true military Man worthy, honorable, with a courage worthy of emulation … God will bless, your heart and all the love in your heart … forever , but Holy word … You wil ! What a “Slap in the face to one our outstanding Generals! As a Marine since August 1959 I learned that the Corps only had one General with 4 stars. The D.I.’s boasted the Corps could do with 4 stars what the rest of the services would require more for. Today we wound up with 4 four stars and the country will miss and rue the day of their loss to the Corps. You Sirs, are appreciated and respected by the thousands of active and non-active duty Marines through out the country. Thank you, you made Marines, you made the Corps and you made history. I worked for Gen Allen while he was CO for TBS. He was one of the finest, most professional Marine officers I’ve ever met or had the privilege to know. As your former chaplain, I wish you well, sir, and continue to pray for you, Kathy, and your family. I worked for Gen Allen when he was a young Captain in charge of Lima Co. 3/4 [wet ninja warriors]. He was the most competent and professional officer I ever served under. I wish you only the best sir and wil pray for your wife and family. Semper Fi! I also salute these men for their duty and dedication to this nation and it’s warriors. I hope that they step forward in the coming days to stand with the people of this Republic against the tyrants in DC. I give you some facts, our gov. is no longer of by or for the people. This gov. created the UN, and wrote the plan to disarm all people, including our own military and civilians “freedom from war”. Read this state dept. document. It also creates a police state in every nation, and transitions to international law via the UN. We are in the final days of freedom, the end run on the constitution is real. We need men like these to step forward and take the reigns from the tyrants in DC. We need the marines to know the truth, for in the eyes of the politicians, they are but fodder. Wake up, spread the word. treeofliberty.com, survivalblog.com are two great locations to learn about the out and out tyranny. I come from a line of dedicated fighting men, I thank you all for your service to our nation. In saying that, the real test is about to hit our shores. If you are fighting along side a blue helmet in America, you are making a huge mistake. God bless those with pure hearts, hearts of true patriotism, not those who do what evil tyrants tell them to do. Patriotism can be a tool to keep people from seeing the truth, be careful. Spend time at the aforementioned sites if you want to learn the truth. 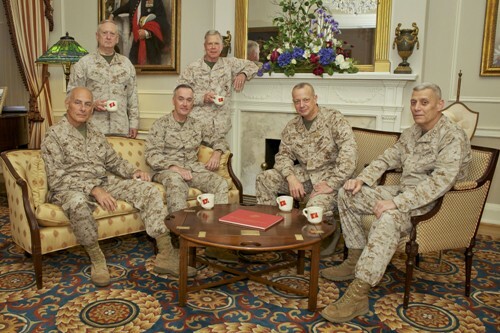 Where will be Gen John Allen?